We are excited to announce and congratulate YLC's 2018 Leadership Development Series class of 2018 graduates! YLC Announces 2018 LDS Graduates! NEW ORLEANS, LA – Since 2003, Young Leadership Council (YLC) has hosted Leadership Development Series (LDS) as a service to its members. LDS teaches participants the basics of running a non-profit organization or a YLC project. On December 4, the 2018 LDS class held their closing session, concluding yet another successful run of the series. Held at the Bayou Oaks at City Park Clubhouse, participants gave final presentations before holding a graduation ceremony to celebrate their achievement. 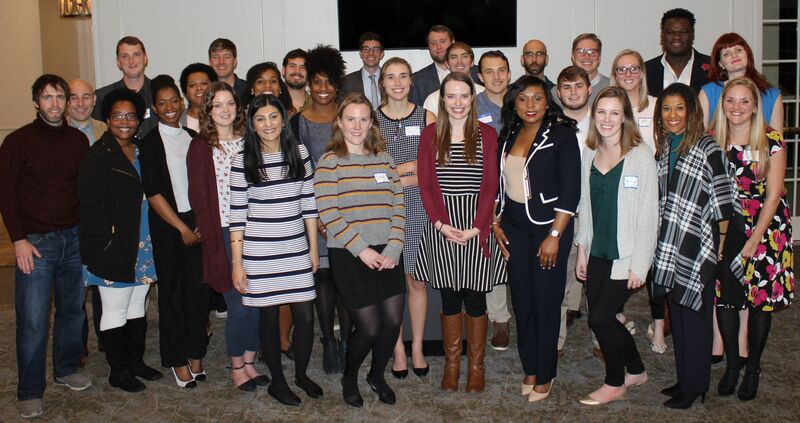 Leadership Development Series 2018 graduates include Stephen Abadie, Antonio Alonzo, Srinee Bajaj, Chelsea Beaver, Donica’ Beckett, Blake Bourgeois, Quiana Brown, Colin Brunet, Karen Burks, John Carlisle, Sally Cox, Alex Davison, Hannah Dimmitt, William Faulkner, Charlie Fenton, Ryan Fisher, Elle Gueringer, Katherine Hammer, Lori Jackson, Kayla Kauffman, Zachary Kromkowski, Jazmyne Lemar, Kahlida Lloyd, Dan Morrell, Eileen Moynihan, Libby Nelson, Graham Patterson, Jacob Peters, Kevin Phillips, Rachel Skowyra, Todd Wackerman, Beatrice Waesche, Graham Williams, Steve Williams, and Tiffany Young. Throughout the series, class members develop a concept for a project or organization over a 10-week period. Each week they receive specific direction about fundraising, community relations, volunteer recruitment, finances, marketing, and other categories that are vital to a successful organization. Each class has a guest speaker who is considered an expert in their field. In 2018, LDS speakers included Michael Hecht of GNO Inc., Wesley Palmisano of Palmisano, Jacqueline Brettner of Carver Darden, Mark Romig of the New Orleans Tourism & Marketing Corporation, Darrin McCall and Jeff Mika of Youth Empowerment Project (YEP), Andrea Chen of Propeller, Kara Van De Karr of Eden House, Patrick Comer of Lucid, Dennis Lomonaco of Story Block Media, and Lee Zurik of Fox 8. Like all YLC Projects, Leadership Development Series is led and organized by volunteer community leaders. Project Leaders for the 2018 series include Josie Delaune, Andrew Koehler, Stephen Sewell, Dominik Cvitanovic, Clara Baron-Hyppolite, Meredith Graf, and Kristie Kaaa. LDS project leaders would like to thank all of their partners and sponsors. Through their charitable gifts, YLC is able to continually put forth one of the most effective Leadership Development programs in the Greater New Orleans region. The program’s goal of enabling and training the next level of leaders in the community was made possible through the generous support of Junior Achievement, Carver Darden, Palmisano Construction, Lucid, GNO, Inc., Propeller, New Orleans Tourism & Marketing Corporation, Story Media Block, Youth Empowerment Project, Fox 8 News, Pythian Market, Dragos, Eden house (Kara Van De Karr), Petro-Marine Underwriters, and Babes and Beignets. Young Leadership Council is a nonprofit, nonpartisan civic organization created to develop leadership through community projects. Through volunteer-created community projects, YLC recruits and retains young professionals to New Orleans, creating a positive impact on the quality of life in the region. The oldest, independent YPO (young professionals’ organization) in the country, YLC has raised more than $25 million to support community projects in and around the Greater New Orleans area since 1986.